I didn’t realize the extent of the Mennonite church’s political involvement leading up to WW II, in 1937-1940. During that time, Mennonite church leaders wrote resolutions stating the Mennonite’s convictions regarding war and even met with President Roosevelt on more than one occasion. Along with the Church of the Brethren and Society of Friends, the Mennonites continued to advocate a place of recognition for their young men that had a conscience against the “destruction of human life.” Orie Miller (pictured above on the National Service Board for Religious Objectors [NSBRO]), Harold S Bender, and E L. Harshbarger were just a few of the Mennonite leaders that worked tirelessly during this time period by traveling to Washington DC and presenting proposals that outlined the foreign relief, mental and medical health projects, and reforestry work that could be accomplished in CPS camps. But the actual 1940 presidential approval came only after the Mennonite Church agreed to finance the CPS camps and the men. 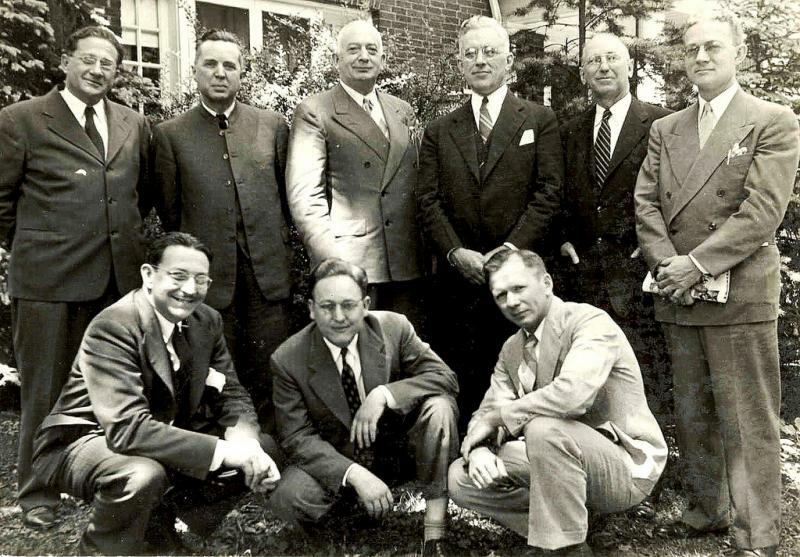 In our Franconia Conference, a Peace Problems Committee of John E. Lapp, Jacob M. Moyer, and Jacob C. Clemens was formed. “To aid in teaching nonresistance and to impress upon the people the urgency of the situation, the committee arranged for a Nonresistance Conference for September 3 and 4, 1939, which was held at Souderton Church.” After President Roosevelt signed the Burke-Wadsworth Conscription Act, making it law that all male residents between the ages of 21 and 35 register with their local draft board, this committee was on constant call, assisting registrants in filling out questionnaires, interviewing draft boards, and advising young men of draft age. Many men from Franconia Conference benefited from the cordial relationship between the draft boards in Lansdale and Doylestown and the peace committee members, particularly John Lapp. John helped many men navigate the unfamiliar world of Selective Service Law and draft board members that questioned their sincerity. These men had an immense support from their churches when they took that step of proclaiming their conscientious objection to war. See http://civilianpublicservice.org/ for more information.